The women singles final Saturday was a rather disappointment as French Bartoli beat her German counterpart Sabine Lisicki in an almost one sided match 6-1 6-4 to lift her first Venus Rosewater Dish and win her first Grand Slam title of career. 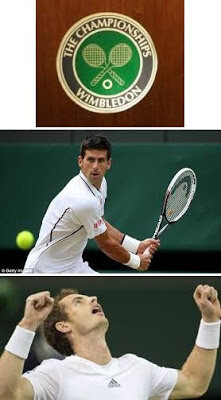 Now all eyes are set on one of the most important Wimbledon finals, specially for the British, as Andy Murray will try to win the Wimbledon title to bring an end to Britain's 77 years long title drought when he plays against world no.1 Serbian Novak Djokovic. It was last year when Murray's hopes were shattered by Roger Federer who beat Murray in the final. Now the opponent has changed - Djokovic which beat Murray at the Australian Open earlier this year in the final. In fact Djokovic has beaten Murray three times in succession in their last three encounters at Shanghai (2012), London (2012) and Australian Open (2013). It thus remains to be seen whether Djokovic shatter's home crowd's dream of seeing a Britain winning or lets it out to Murray! !